Footnote 6 from a catalogue essay by Norbert Lynton “Five Sculptures by Anthony Caro”, Arts Council touring exhibition 1982. This seemingly casual and unapologetic statement regarding the particular properties and limits of three-dimensionality in sculpture, with specific reference in this case to the work of Anthony Caro, but implying a much wider acceptance amongst artists, critics and historians, gives us our first clue as to the sculptural territory that Anthony Smart has chosen to occupy and the orthodoxies he has dismissed. To be more precise: if one considers the above statement for a little longer and perhaps a little deeper than was intended and if one intellectually presses on beyond its straightforward acquiescence and asks the simple question “Could sculpture be more three-dimensional than this?”, then one might get a glimpse of the main motivating force behind Smart’s chosen direction. To begin to answer it – as Smart is doing – is to begin to see the potential for a new kind of sculptural freedom, namely the opportunity for abstract sculpture to go anywhere and be anything, unconstrained by the legacy of literal objecthood within which it has operated for the last fifty years or so, and free from the constraints of frontality, free from the naming of “front” and “back”, and notions of the “best view”; indeed, unhindered by any number of named and nameless props and crutches upon which sculpture has to date been hung. No sooner do we get a little glimpse of the terrifying array of possibilities of such an abandonment of our familiar everyday world of two-dimensional images and one-dimensional allusions, than we realise that with things that are truly three-dimensional we are all of us all at sea, without the means or the language to easily deal with the experience. We are in a place of weird, unfamiliar and difficult structures that don’t conform to familiar patterns of things we already know. Do we want scary? Yes we do. We have to turn off the lights to see shooting stars. Smart has described his new sculpture as “freestyle”. By ignoring the many comfort-zones of literal content and identity in abstract art, and the constraints upon structuring that follow from them, he now presents us with unfamiliar, imaginative and far-flung visual structures which operate in spaces as fully three-dimensional as we have yet seen. Smart has indeed chosen a path that has “no basis in history”. Good for him, and to his credit. In any case, abstract sculpture is itself relatively new and undefined, being less than fifty years old in its “mainstream” form, and so has no basis in history either. This is as yet a largely unexplored world; I would go so far as to suggest abstract sculpture is a new art form, still in its infancy, differing radically as it does from all preceding figurative sculpture and inhabiting space in ways that are only available to work which is properly abstract. So the first positive thing to say about Smart’s new work is that they are pointing the way to a big, optimistic future for serious abstract sculpture, opening up new territory, and coming at a time when many thought it was dead in the water and any number of its erstwhile practitioners and champions had more or less abandoned it for more fashionable and easier pursuits. Because, make no mistake, this kind of sculpture is fiercely difficult to make. In the first decade of radically abstract work in the Sixties, sculpture changed from a vertical, columnar, circumscribed set of forms, into an horizontal, non-figurative, open spatial arena. Three-dimensional art could now encompass real space, across a limitless horizontal plane (the ground), and could therefore act in all sorts of ways it never could previously, including operating in the same literal space as human beings. Much has been made of Caro’s abandonment of the plinth, but the essential change was the shift from vertical to horizontal, and the chance to then re-size the space of a sculpture to match actual human scale. But most objects in the world, including most artworks now labelled as sculpture, are literal objects, and are not built to encompass the extreme conditions of full, illusionistic, plastic three-dimensionality which the scrutiny of being a sculpture ought perhaps to require of it. Simply naming a thing “sculpture” does not fulfil those conditions (although this was a popular strategy at the time). It requires exquisitely difficult thought and practise to enable those extreme conditions for abstract sculpture, and their subsequent spatial and formal values, to prosper and develop; and for the most part, when faced with the choices and dilemmas of a career in art, the majority of artists can’t be bothered to work it out – and this includes the generation of sculptors who had started the revolution in the first place in the Sixties. Subsequent generations, enamoured with the novelty of it all, were certainly not going to bother trying to untangle this new confusion because it was much too exciting as a confusion; also too difficult and obscure to unravel; and containing as it does a seductive opportunity to benefit from the ensuing perplexity and mystification of art. No sooner had we differentiated sculpture from statuary than we attained a new state of confusion, between sculpture and objects. But Smart did bother to try to untangle this confusion, and so here we arrive at the main reason why his work has taken a different path from much other sculpture since the Seventies. One might say that this avoidance of the literal is synonymous with the avoidance of “ideas”. And even mindful of what Michael Fried has written on the subject, most sculptors from the period, including all of the New Generation sculptors who followed Caro, relied to varying degrees upon a vocabulary of literal ideas and images for their work’s identity as three-dimensional objects. The critical landscape for sculpture from this period is littered with references to the literal world of objects. It is true to say that literalness is the state into which almost all sculpture in the Sixties and Seventies to a greater or lesser extent fell. It is where sculpture still is as far as most artists and the broader new audiences for art are concerned; hence the literalism of almost all contemporary art, which has by escalating degrees followed this particular path to its brain-pulping conclusion. 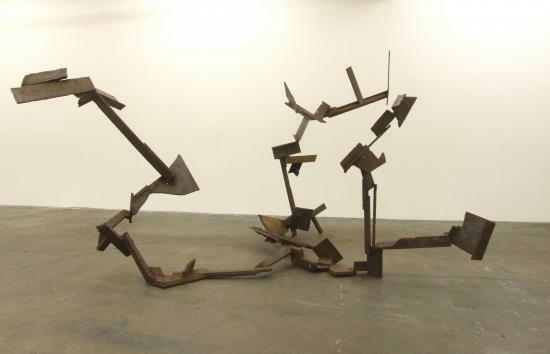 In the early Seventies, a progressive and self-critical working practice was set up by a group of sculptors working in welded steel in Stockwell Depot, South London, led by Peter Hide and including Smart, John Foster and Katherine Gili. Through a new and aggressive directness in their work, they began to question some of the orthodoxies of taste in the abstract sculpture of the time (the more trivial and fetishistic preoccupations of the art scene in general were simply ignored) in order to make a little of their own independence and originality felt. Smart made a forceful repudiation of pictorialism’s weightlessness and lack of physicality in his “Tamarind” and “Stirrup” series of sculptures from the mid-Seventies. Hide, Foster and Gili too stamped their own individual sensibilities upon abstraction, with increasingly more massed and concentrated works, particularly by comparison with the preceding “New Generation” of sculptors from a decade before. We should note here that from the early Seventies, and independent of the Stockwell group, Tim Scott had moved away from the literalness of his early work and in 1972 had begun to introduce a more physical manipulation of his material. He had started to forge steel to bring out its malleable plastic qualities, and this of and by itself necessitated a more fully-rounded, more three-dimensional way of thinking, which was to prove a prescient part of the way forward for Smart. By the late Seventies there had arisen amongst a small number of sculptors and students associated with St. Martin’s a profound dissatisfaction with the slender critical perspective of Modernist taste, and this was about to precipitate a sea-change in the work of this group. Perhaps the most noteworthy influence on Smart, particularly at this time, was the teaching, writing and comradeship of the painter Alan Gouk. What Gouk did most convincingly as a teacher of sculpture (quite aside from his considerable achievements in painting) throughout the Seventies, and with increasing force as the decade progressed, was to put his full intellectual weight behind finding and analysing historical examples of alternative ways to proceed in three-dimensions that might allow abstract sculpture to regain some degree of genuine three-dimensional physicality. He instituted amongst the staff and students at St. Martin’s a sustained study of the comparative history of sculpture throughout all world cultures and periods, not from the point of view of an art historian, but in order to look at the direct relevance of such work to the contemporary condition of sculpture. This culminated in Gouk delivering the essay “Proper to Sculpture” (published later in Artscribe) as a lecture at Wimbledon School of Art in 1980. Already prior to this, Smart, who was by now teaching alongside Gouk at St. Martin’s, had begun looking into the physical structures of specific historical sculptures. There began a period of open-ended analysis and interpretation of these structures, without too much foreknowledge of how to turn them directly or indirectly to sculpture, even though the desire for sculptural achievement remained paramount. These new structures, although discovered firstly in figurative sculpture from the past, were gradually elicited from a radical new use of life-models. The more three-dimensional these structures were, the better. Before long it would come to seem to Smart and others at St. Martin’s that the most three-dimensional, physical, differentiated, holistic and interdependent structures relevant to sculpture were those which constituted the working parts of the human body. The image of the figure was always eschewed in this, even when anatomy was tackled head-on in order to better understand the inner workings of the body. The emphasis was categorically on “the body” and not “the figure”. That “Sculpture from the Body” (as it became known after the Tate Britain show in 1984 “Have You Seen Sculpture from the Body?”, organised by Smart, Katherine Gili and Robert Persey) produced rather few sculptures of any status or lasting significance is put into perspective, at least as far as Smart’s work is concerned, by its consequences as a way of thinking about sculpture which avoided literal objecthood and image. The “body-as-structure” blew away frontality, pictorialism and a lot more besides – it could do nothing else – but what it put in its place was immensely complex, and not simple to make use of directly in sculpture. This engagement with the physical and the three-dimensional properties of the body is the key place where Smart arrived in the Eighties. A series of forged steel sculptures were made, the early ones being recognisably from the body, and the latter ones, seeking some sculptural resolution independent of the body, simplified themselves by degrees, and in more abstract forms, into forceful interpretations of the body’s “sense of purpose”. By the early Nineties, Smart had moved on again. His re-engagement with the large-scale openness and transparency possible in abstract sculpture was to inform his next moves, but all he had learnt from “Sculpture from the Body” came with him. So where are we now? More than twenty years have elapsed since Smart last used a life model to inform his sculpture, and no obvious correspondence exists between Smart’s new work and the structures of human anatomy. But that very same thinking – about the physical realities of form in space, its displacements and its relationships and effects across space – has, if anything, become even more focused and concentrated. That these new sculptures in the present show can occupy the same floor space as the viewer without resort to literalness is already an achievement of note, although it causes difficulties both in their making and in our subsequent business of looking at them. There is no longer a vestige of confusion about their abstractness. Nor, any longer, do they seek to plastically manipulate the material, other than by illusion; that is, by the implications of visual relations between parts. They are spatial organisations, but they do not rely upon geometry for their spatial relationships. Each move they make, each spatial articulation, attempts to extend the previous one, not by repetition, but by variation. The stakes are very high for these works, not least because the elimination of literal content means they have nothing to fall back upon if they do not succeed as sculpture. They are also quite obviously more complex than most abstract sculpture we have previously encountered. Is this good or bad? All my instincts say “good”, though of course it is all to be proven. In any case, what do we mean by complexity in art? Is a late Beethoven piano sonata complex or simple? Complex, but not complicated! I said at the beginning of this essay that abstract sculpture had now the possibility to “go anywhere and be anything”, but in fact the “thing” that sculpture must become is its very own sweet self, at last. Abstract sculpture can get at the very heart of this in ways figurative sculpture never could. The fact that Smart’s new sculptures don’t look like “anything”, like any object in the world, is in their favour, in the long run, and if that is going to make them “difficult”, so be it. At last, I say again; about time. We have had fifty years of abstract sculpture based in various states of “objectness”, on every conceivable kind of literal crutch, we have just about run the gamut of it and it is for the most part going nowhere. Now, along comes Smart with works that fairly fizz with formal and spatial potential, but which don’t need to rely upon allusion for their reality, or indeed for their meaning. They are physical sculptures, but they are not about “objectness” – “table-ness”, “door-ness” – likewise running, jumping, sitting; they don’t allude to these activities. They are in fact about their own “sculptural-ness”, their own profound state of three-dimensionality. They explore sculptural space for us, because we can’t do it ourselves, we are literal and they are not. They explore for us the reality of artistic illusion, a world entirely based upon relationships. To spend any time with Anthony Smart is to become aware of his acute engagement with the physical world – its landscapes, rivers and mountains, its plants and trees, its seas and its harbour walls, its buildings in its towns and cities; his imagination is deeply rooted in the whole of the natural and man-made morphology of the world, the relationships between things, the purposes of such relationships, its whole dynamic geography. Such a sensibility about the outside world drops directly in upon his own imaginative world of space and form, of manipulation of material, in order to find functioning relationships within the work that will in turn influence space, put pressure on it, to shape it and mould it, to make it ever-changing but purposeful, to make us aware of the sheer unstoppable activity of space. There is at the heart of this work a quite brilliant vital thrust, but it is, in the actual presence of the work, rather elusive – you will just have to track it down and dig it out for yourself, as it is not going to sit up and beg for you. Don’t think that because I said these works explore three-dimensionality for us that you don’t have to work at them. You need to stalk them a little, you must circle them, you must experience them in time as you walk around them, and all that time they won’t even hint at anything you can put a label on. But you will get something undeniably new and positive out of them. Despite their first appearances of “busyness” and complexity, and of playing a little fast and loose, they are by nature substantial and measured. You can walk and you can talk around this work, and you will discover that they put something into the world new and original which does not rely on any other thing in the world for its merit. And this is just as it should be; this is the future of “abstract”.